1634599071 -This casebook emphasizes current doctrine and its historical evolution in exploring the four basic foundations of federal administrative law: separation of powers, statutorily- and constitutionally-required procedures for agency adjudication and rulemaking, scope of judicial review of agency action, and the availability and timing of judicial review. 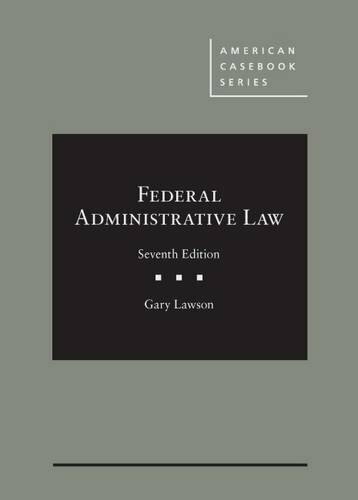 The book concentrates on federal rather than state administrative law in order to provide the fundamental knowledge and concepts necessary to understand the subject, on the belief that an understanding of federal law can be translated into other settings. The book also maintains the straightforward organization and don’t-hide-the-ball presentation that has characterized the book since its inception. The Seventh Edition contains five new principal cases, eight major new note cases, ten shorter new note cases, and updated treatments of all major topics. It also includes a revised Chapter I that includes an extended treatment of statutory interpretation to accommodate the increasing inclusion of Administrative Law in the first-year curriculum.